Web Services in Sahana Eden are implemented as a RESTful API (Application Programming Interface). The RESTful API uses Sahana Eden's native S3XML format for data exchange. Other XML or JSON formats are supported using on-the-fly XSLT transformation - Sahana Eden provides built-in XSLT stylesheets for a variety of XML standards (e.g. KML, EDXL-HAVE), and can also accept custom stylesheets. For the <query> syntax, see the following section. Note that special characters in values must be properly URL-encoded (the %20 in this example stands for a blank). Note that in URL queries, date/time values must be in UTC and use the ISO-8601 combined format YYYMMDDThh:mm:ss. in XML and JSON, resources are always exported/imported including all their components and referenced resources. Interactive formats are HTML (Extension ".html"), or PLAIN (Extension ".plain"). If no format extension is specified, HTML format is assumed. some resources support other methods, e.g. Any format extension that is not listed under the interactive formats, is treated as non-interactive. It is possible to access privileged resources by providing the username/password within each request, rather than the usual method of having the login stored within the session. The RESTful API supports HTTP Basic Authentication (http://en.wikipedia.org/wiki/Basic_access_authentication). Note: for some command-line tools like wget or RESTClient you might need to additionally activate an option for pre-emptive authentication (unsolicited sending of credentials). E.g. for wget, use the --auth-no-challenge option. If there was an input element tree and it contained any errors, a subtree with the invalid elements will be added to the JSON message ("tree"). This subtree is expressed in JSON Format. Invalid elements will have an additional @error attribute containing a clear-text error desription. By default, an import request will be rolled back (completely) and an HTTP 400 BAD REQUEST error be returned if the source contains any invalid data. You can override this behavior by using the ignore_errors URL variable (?ignore_errors=True). Invalid records will then be skipped, while the valid records will be committed to the database and the request returns a HTTP 200 OK. The JSON message in the response body would however contain the error message and the element tree with the invalid elements. Note that ignore_errors applies to Validation Errors only. Any other type of error (e.g. XML syntax error) will be handled as usual (=rollback + error message). The ignore_errors option is meant for "dirty" data, e.g. cases where you need to import from a source but do not have permission and/or means to clean it up before import. In all other cases, where possible, you should avoid ignore_errors and rather sanitize the source. The Sahana Eden RESTful API can perform XSLT transformation of XML sources into the S3XML format on-the-fly when exporting or importing data. You cannot use the .xml or .json extension if the source is to be transformed. By these extensions, the interface assumes the source is already S3XML. Non-XML formats such as PDF or XLS do not support on-the-fly transformation. If you use transform to specify the stylesheet location explicitly, any existing internal stylesheet for the format extension would not be used. This does work with any XML format, e.g. KML - if you wanted to provide a map rather than a feed link. 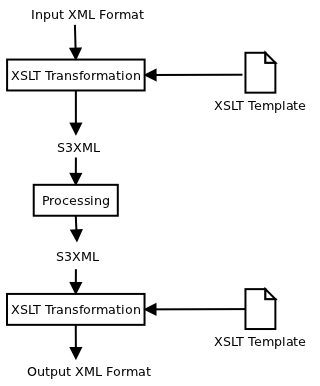 For data import, an XSLT stylesheet to transform foreign XML into S3XML can be attached to the request. The filename of the attached stylesheet is expected to be <resourcename>.xsl, where <resourcename> is the name of the target resource (without module prefix, e.g. person or hospital).